It is very difficult to get a handle on the reduction of uninsured as a result of the ACA, but it seems to be somewhere around 20M, about half of the reduction due, not to the troublesome health care exchanges but to Medicaid expansion and to the requirement that young adults up to age 27 can stay on their parent’s policies. Both of those changes could have been accomplished without the ACA through what I am going to call “Creeping Coverage,” tweaks to existing laws and regulations that do not require major upheaval of the whole system. And, even for those 10M or so who are purchasing insurance on the exchanges, it is unclear how many had other insurance previously or would have been insured some other way without the ACA. And it seems impossible to find the true economic impact on government spending of the ACA. Since most purchases on the exchanges are for highly subsidized premiums, the cost will almost certainly surprise on the upside. This Bloomberg article details the confusion and complications and concludes that, “the number of would-be-uninsured people now covered by Obamacare is almost certainly north of 10 million. I’m not sure exactly how far north. And I’m not sure we’ll ever have a better estimate than that, either.” It could be that as much as half the improvement is due to the older dependent rule and the Medicaid expansion. But, there are still about 30M uninsured so any declaration of victory seems ludicrous. I’m calling it Public Option – Creeping Coverage, POCC for short. POCC can begin by expanding Medicaid to cover all who are on SNAP (Food Stamp) payments or in Section 8 Housing and expanding Medicare to cover everybody on Social Security but not yet 65 years old. These are simple administrative changes that will increase health care coverage and government employment but create no new bureaucracies and will not involve the IRS. The next step would be to expand Medicare to cover anybody with cancer, heart disease, diabetes, and perhaps a few other expensive acute or chronic diseases. Means testing would, of course, be required for such coverage, and Medicare Taxes and premiums would have to increase. There is no point in government picking up the medical bills for those who can afford to pay their own way, and there is no reason for government to subsidize the health care providers with borrowed money. We are a wealthy nation, and we can afford to pay our bills. Then Medicaid can be expanded to include anybody on any means-tested government assistance program. A couple of years ago, there were 79 such programs. You can find details and a list here. Means testing would be a new wrinkle, and higher taxes and premiums would cause indigestion for some, but Medicare now pays out $2 in benefits for every $1 collected in Medicare taxes and premiums. A line has to be drawn somewhere to stop growth of our debt as a percent of GDP. The precedent for government provided health care expansion is well established. Medicare was established in 1965 to take care of the small number of seniors who lived past the normal expected life span at the time, 67 for men and 74 for women. 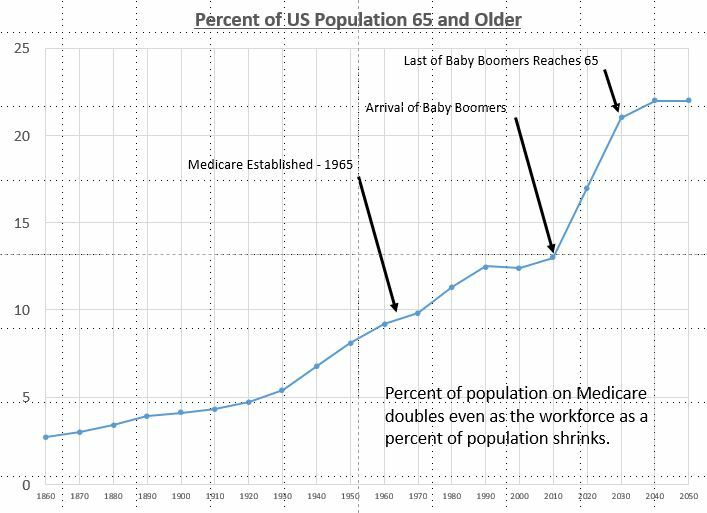 A very small percentage of the population qualified, but the number of persons on Medicare has continued to increase due to population aging and rule changes. Medicare was expanded in 1972 to cover dialysis patients and others on SSI disability, and, in 2001, people with Lou Gehrig’s disease. Now 17% of the population is covered by Medicare. The final essential step would be requirement of pricing transparency and fairness in medical services. Patients and insurers must be able to evaluate pricing options and make wise choices about where and by whom to be treated. Private deals between providers and insurers cannot be allowed because such arrangements restrict freedom of patients. And, yes, there would still be a few million who just couldn’t get signed up and would have to go to the emergency room. Once they are broke, a social worker can help them fill out the Medicaid paperwork. Next Post Why So Quiet?